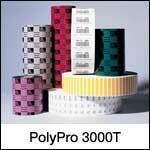 The PolyPro 3000T (formerly PolyPro 1000) is a matte topcoated white polypropylene thermal transfer label stock that produces high-quality black bar codes and human readable fonts when used with compatible Zebra ribbons. Features a high-performance permanent acrylic adhesive. Suggested applications include: chemical drum labeling, product labeling and retail applications. Use with wax/resin or resin ribbon. 1.50" x 0.50" polypropylene thermal transfer label on a 1" x 5" core. 3780 labels per roll / 8 rolls per case. Zebra 18930 special features - Perforated. Use with wax/resin or resin ribbon. 2.00" x 0.50" polypropylene thermal transfer label on a 1" x 5" core. 3780 labels per roll / 8 rolls per case. Zebra 18928 special features - Perforated. Use with wax/resin or resin ribbon. 2.00" x 1.00" polypropylene thermal transfer label on a 1" x 5" core. 1720 labels per roll / 8 rolls per case. Zebra 17154 special features - Perforated. Use with wax/resin or resin ribbon. 2.00" x 1.25" polypropylene thermal transfer label on a 1" x 5" core. 1720 labels per roll / 8 rolls per case. Zebra 18925 special features - Perforated. Use with wax/resin or resin ribbon. 3.00" x 1.00" polypropylene thermal transfer label on a 1" x 5" core. 2100 labels per roll / 8 rolls per case. Zebra 18924 special features - Perforated. Use with wax/resin or resin ribbon. 4.00" x 2.00" polypropylene thermal transfer label on a 1" x 5" core. 1110 labels per roll / 4 rolls per case. Zebra 18932 special features - Perforated. Use with wax/resin or resin ribbon. 4.00" x 2.50" polypropylene thermal transfer label on a 1" x 5" core. 900 labels per roll / 4 rolls per case. Zebra 18929 special features - Perforated. Use with wax/resin or resin ribbon. 4.00" x 6.00" polypropylene thermal transfer label on a 1" x 5" core. 390 labels per roll / 4 rolls per case. Zebra 18926 special features - Perforated. Use with wax/resin or resin ribbon.